I remember my first “a-ha” experience with delicious coffee. I had ventured into a small coffee roaster out of curiosity. The barista behind the coffee bar greeted me as I came through the door. I was feeling adventurous, so I chose the most unusual-sounding drip coffee: Sumatra Mandheling. I was expecting a cup of coffee, but got something far more fascinating. It tasted fruity, smooth, and just a little funky, like that smell you get when you finally pick up that pile of leaves from last month’s raking to put in your garden compost bin. But I liked it. I bought some ground coffee to take home. That was over 10 years ago, and I’ve been obsessed with specialty coffee ever since that day. It was interesting for me to learn later that Sumatran coffee, while certainly unique, isn’t all that unusual. Sumatra is one of thousands of islands located in the Indonesian archipelago. Indonesia has held steady for several years as the fourth-largest producer of coffee in the world. Coffee was first introduced to the islands in the 1700s by Dutch colonists, on the island of Java. After a bit of a rocky start, farmers were producing enough coffee to export to Europe by 1717. The Dutch continued growing their coffee production and export business until they were the largest supplier of coffee to the world. In fact, the Indonesian islands remained the largest exporter of coffee until the 1840s when Brazil took the lead. Indonesia cultivates both Arabica coffee, known for its fine flavor qualities, and Robusta coffee, known for its high caffeine content. Arabica coffee plants require more care and higher altitudes, while robusta plants grow well in lower altitudes and are more disease and pest resistant. In 2014, 25% of the coffee exported was arabica, and 75% was robusta. While robusta coffee is the larger segment of their coffee exports (about 75%), we’re going to focus our attention on the arabica coffees produced in Indonesia. While not as large, the islands of Bali, Sumbawa, and Flores also cultivate delicious coffees. As the coffee production on these islands has grown over the past few centuries, each of the islands developed their own approach to cultivation, harvesting, processing, and storing the coffee beans. Because of this, each island’s coffees are quite diverse in flavor qualities. All coffee is fresh roasted-to-order for you. $5.75 USPS Priority shipping. Additional coffees from GoCoffeeGo ship for $3.50 regular or $7.70 bulk. Top Award Winning Artisan Roasters and their coffees are at GoCoffeeGo. Sumatran coffees are renowned for being smooth, sweet, and balanced. Flavor qualities may include hints of cocoa, earth, tobacco, smoke, or cedar wood. Some Sumatra coffees will display a pronounced acidity, which helps balance the heavier flavor notes. This acidity will often remind the drinker of tropical fruits like grapefruit or lime. However, most Sumatran coffees demonstrate a low acidity. Sumatra coffees get some of their distinctive flavors from the “giling basah” or “wet-hulling” processing method common with the island. It is this method that gives Sumatra coffees their full body and lower acidity. This process is not to be confused with the “wet processed” or “washed” coffees common in places like West Africa or South America, and even closer places such as Bali or Java. Fun Fact: Indonesia is also home to a more infamous form of coffee processing, if you could call it that. Kopi luwak, or civet coffee, is created when coffee cherries are eaten by the Asian palm civet. The cherries are fermented in the creature’s intestine, and excreted, partially digested. The coffee beans are then removed from the civet’s dung, washed, and sold for an inordinate sum. Sorry, but, “YUCK!” Annnnd…moving on! Wet-processing, or washed process, involves fermenting the coffee cherries in large tanks, and then washing off the fruit pulp (mucilage), followed by drying the coffee beans in some fashion. The wet-hulling process involves the coffee farmer peeling the skin of the cherries off in a hand-cranked pulping machine, then fermenting the fruit-covered seeds in a number of ways: in a polypropylene bag, a plastic tub, a concrete tank, what have you. After an overnight fermentation, the fruit pulp has broken down enough to be washed off, resulting in wet-hulled coffee, which is then sold by the farmer in a central market location. The three most well-known Sumatra coffees are Mandheling, Lintong, and Gayo. Mandheling is a trade name for arabica coffee from the Aceh region in northern Sumatra. Lintong can be found on the southwest side of Lake Toba. Gayo coffee is found on the hillsides around Lake Tawar, in the Aceh region on the northernmost tip of Sumatra. During the colonial period, Dutch coffee business owners blended Java coffee with coffee from Yemen, Africa, creating the still-popular blend, “Mocca Java”. The Indonesian coffee trade began on the island of Java, and arabica coffee was thriving there until the late 1880s when a fungus called rust decimated the arabica crop. Farmers switched to growing liberica coffee, which was much more hardy (but less palatable), and robusta. However, in recent years, more farms are growing arabica again. On Java, coffee is wet processed, not wet hulled. Ripe cherries are transported from the farms to the mills, where they are fermented and washed, with good quality control. Because of the wet processing, the coffees are generally clean tasting, with little of the earthy, funky notes associated with wet hulled coffees as found on Sumatra or Sulawesi. Common descriptions might include heavy-bodied, sweet, with a hint of a herbaceous flavor in the finish. Overall, it’s a pleasant-tasting coffee that might not be as dynamic as others from the other islands of Indonesia. On Sulawesi, most of the arabica coffees are grown on the Toraja highlands near the coffee-trading town of Kalosi. The mountainous region allows coffee to be grown at higher altitudes than the other islands in the Indonesian archipelago, which gives coffee from this region some advantages. Sulawesi coffee can be quite impressive, if given the chance. While most coffees grown on this island are still processed using the “giling basah” or wet hulled method, some forward-thinking farmers are partnering with coffee buyers to wet process, ferment, and then dry the coffee beans over a longer time frame. The results are significantly better-tasting, cleaner, with less of the earthiness. One might find a nutty or warm spicy flavor, such as cardamom or cinnamon, and a more rustic sweetness similar to honey or molasses. The island of New Guinea is divided in half, with the western portion, Papua, belonging to Indonesia. The Baliem Valley in the Jayawijaya region. Both locations are between 1,400 and 2,000 meters in elevation, perfect for growing arabica coffee. Papua’s coffee production is on the rise, as investors and coffee companies get involved with making improvements on the farms and processing factories. Farming improvements such as fair trade or organic certifications are becoming a reality even though none of these farms have used chemical fertilizers, herbicides, or pesticides. Here again, coffee is processed using the wet hull procedure. Let’s also take a look at the three smaller islands that round out Indonesian’s primary growing regions. Bali’s main coffee growing area is the highland region of Kintamani, located between the two volcanoes, Batukaru and Gunung Agung. While the island is small, Balinese coffee is quite delicious. The farmers use a washed process, instead of the “giling basah” of Sumatra, Sulawesi, and Papua, which results in clean, sweet, and even citrusy tasting notes. The island of Flores, “flowers” in Portuguese, got its name from Portuguese sailors in awe of the underwater gardens off its eastern cape. The mountains on the island are of a more moderate height, with coffee produced between 1,200 to 1,800 meters. 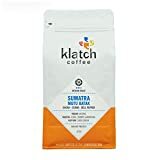 The coffee here has the potential to be sweet and clean with a syrupy body; however, inconsistencies in fermentation times and procedures can result in off, fruity notes. Some producers on Flores have been working with outside companies to improve these situations to create more consistent crops with better quality. Some have also experimented with natural processing, or dry process, where the coffees are not fermented in tanks at all, but are dried with the cherries intact and then milled to remove the raisin-like fruit. This procedure creates a very unique cup with incredible fruit and floral notes. Coffee grown on Sumbawa comes almost entirely from the Sanggar peninsula on the western slopes of Gunung Tambora. The volcano has erupted a few times since colonial days and as recently as 2011, which has made coffee cultivation difficult. This past December, coffee farmers were supposed to be gearing up for the beginning of the coffee harvest following the rainy season. The rainy season didn’t stop, continuing for weeks into the harvest season. As a result, coffee production in Sumatra and other regions dropped 50% or more, even to 72%. The spring coffee harvest, which should be peaking as I write this in early April, is estimated to be down 80% of what was originally expected. Many coffee companies around the world buy crops ahead of the harvest, so most of the current crop is spoken for, and what isn’t will come at a premium price. While that may not seem like a big deal to some, we need to remember that Indonesia is the fourth-largest producer of coffee in the world. Not only will this affect the price of Sumatra or Java coffees, but it may also impact the price of similar coffees produced elsewhere. Many coffee roasters use Indonesian coffees in their popular coffee blends, and depend on them like a baker or cook depends on their favorite ingredients. When a coffee is suddenly unavailable, many roasters have to scramble to find a coffee that will make a suitable substitute, and that can be challenging. In this case, coffee companies may look to arabica coffees coming from Papua New Guinea or other places that produce coffee with similar characteristics. The coffee industry will recover, but climate-related setbacks in coffee production are becoming more frequent around the globe. How long will we be able to get our favorite coffee from our favorite country? What if I’d never had that chance to taste that “a-ha” Sumatra Mandheling? Would I even be writing this article right now?